St. Scholastica's online master of education program has been named one of the best in the nation by U.S. News & World Report. "This validates our efforts to ensure that this program is high quality and very responsive to the needs of our educational landscape," said Amy Bergstrom, program director. "We have great faculty who are excellent online teachers and are really passionate about good teaching." U.S. News & World Report's list of Best Online Programs made evaluations based on student engagement; student services and technology; admissions selectivity; faculty credentials and training; and peer reputation. St. Scholastica's online master of education program was ranked no. 48 of all 267 institutions reviewed. St. Scholastica's 100 percent online master of education degree program is designed for current teachers and other education professionals, and can be completed in two years. Designed with a cohort-based model of no more than 25, the program allows for meaningful connection and collaboration between students as well as with instructors. "A student coming in can expect a high level of faculty engagement and a high level of community building in that environment," Bergstrom said. St. Scholastica has also established several graduate certificates in high-demand areas, including literacy instruction, culturally responsive pedagogy, and computer science in education. These serve as electives for the master of education program. "They were created as a response to the needs of the K-12 setting," Bergstrom said. "They allow our students to differentiate in areas of interest that they have." More information is available online at: css.edu/med. 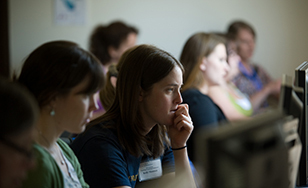 St. Scholastica also offers a variety of other programs geared toward educators, including a B.S. Elementary Education degree completion program based in St. Paul and a Graduate Teaching Licensure hybrid program with online classes and in-person courses in Duluth, St. Cloud and the Twin Cities.